On a very busy news day, I had a great time talking dorm decor tips with co-host Abby Huntsman this morning on "FOX & Friends." 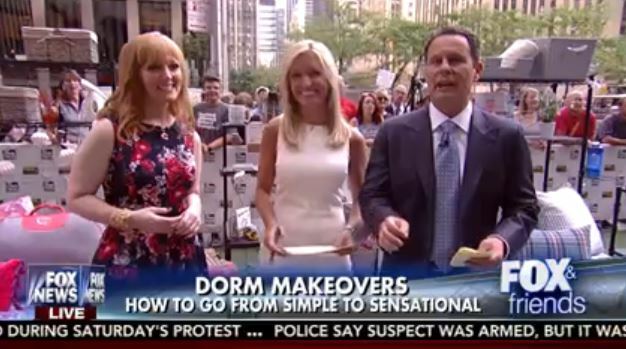 The unseasonably cool weather was perfect for taking over the FOX News plaza in midtown Manhattan and setting up a dorm room with all of the latest trends! Here is a link to the segment on the FOX News website, along with links to many of the items shown. Later this week, I'll share an extensive look at how friends at my client Bed Bath & Beyond built this gorgeous set! * Photos from FOX News. Watch Me Sunday on "FOX & Friends"
If you're up early this Sunday, please tune in for my segment on "FOX & Friends." Grab a cup of coffee, settle in, and watch us take over the FOX News plaza in midtown Manhattan with all of the latest gear for college dorm rooms. I am scheduled to be on the show between 9:30 a.m. and 10 a.m. ET (that's 8:30 a.m. and 9 a.m. CT), but that time can always shift due to breaking news. If you don't see me right way, please stick around for a bit - or just set your DVR. If you want to get a extensive look behind-the-scenes of the show, please follow along on my Instagram stories. Midsummer always puts me in a back-to-school mindset. Cute new school supplies hit the shelves, and I get to work with Bed Bath & Beyond to decorate dorm rooms for TV shows and share tips on organizing a stylish and functional space. This year, I'm more in the college state of mind than usual, since I am in the midst of doing a master's degree program online. While I don't have a dorm room to decorate, gearing up for these shows always inspires me to do a bit of redecorating and organizing in our little Manhattan apartment. Do your homework. 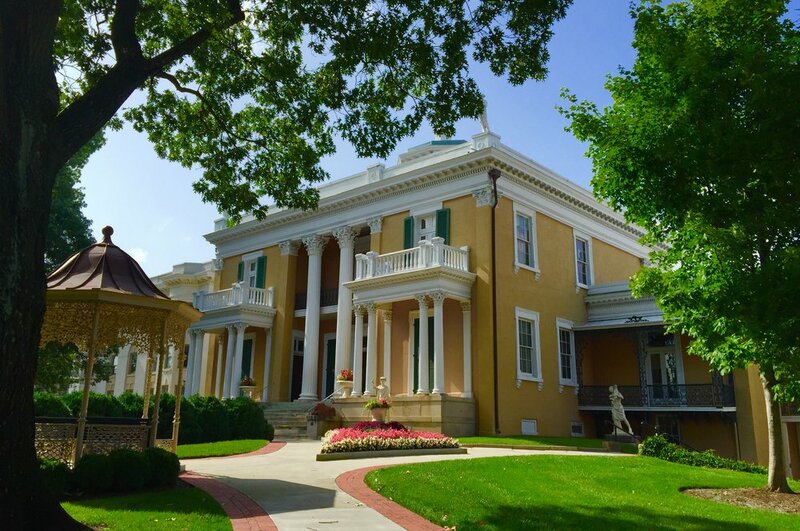 It is exciting to shop for the dorm or new apartment, but if you're living in student housing, check the school's website to get the floor plan, what is furnished, and - importantly - the list of things prohibited in student housing. Checking in with your roommate to plan who will bring what can also save time and money. Sleep tight. That dorm bed has probably been around awhile, so you'll want to layer linens to make it cozy and comfy. A memory foam mattress topper will give you a comfy and supportive foundation, and a mattress protector that completely encases the mattress is great for people with allergies. Top it all off with a comforter set or bed-in-a-bag that expresses your personal style and sets the tone for the overall room decor. Multi-task. Space is limited, so bring things that can do double- or triple-duty for you. If your bed can be lofted, these bed lifts create tons of extra storage space underneath - and the extra power and USB outlets on them come in handy with all of the gadgets that have to be charged. Storage cubes provide storage and decorative accents, and also serve as seating or footstools. Desk and floor lamps with USB outlets provide needed light and charging space, and over-the-door or hanging closet organizers can corral everything from shoes and sweaters to school supplies and snacks. Travel light. When I headed to college for my freshman year, there was barely room for me in my parent's van after we packed in all of my stuff. I wish I could have had a program like Bed Bath & Beyond's "Pack & Hold" program. You do your shopping at a store close to home, but they then package everything for you to pick up at the store closest to college! No packing, shipping, or schlepping. Get expert advice. Bed Bath & Beyond is offering free in-store events in July, where you can shop with an expert, learn how to organize your room, and get access to special offers. Check the this schedule to find an event near you. Living in a dorm for four years at Harding University, I developed strong skills in organizing small spaces. I have kept those sharp while living in New York City, and get to use them each summer when I do TV segments on dorm decor for Bed Bath & Beyond. For every segment, several people from their local stores load enough furnishings for a dorm room into TV studios, and we build a "dorm room" on the sets. Sometimes, we even get to do location shoots on campus! 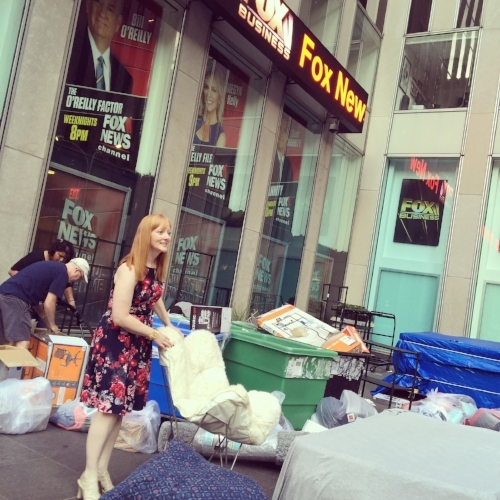 This week, I was excited to be back at "FOX & Friends" - setting up not one but two dorms rooms on their plaza in midtown Manhattan. After delivering a van filled with furniture, beds, bedding, decorative accessories, gadgets and other dorm furnishings several days in advance, my friends from Bed Bath & Beyond arrived shortly after 5 a.m. to build the set. Just imagine doing this outside in thick humidity - and temperatures already well into the 80s even before the sun came up. (I'm just in this picture for show - they are doing all of work here). More than two hours later - voilà! We're ready to roll. I wish we had many of these cute things to bling out my dorm room - most notably, the colorful bedding and faux-fur chair. Of course, the space you see below is much larger than any of my actual dorm rooms. And we're live! Watch the full segment here. Live on "FOX & Friends" with hosts Ainsley Earhardt and Brian Kilmeade. Thank you to Coldwater Creek for the dress!